Companies are investing a lot of money year after year to communicate with their customers and influence their perception of their company and brands. The budgets are there basically to sow for future sales and they remain on the same level year after year measured as a percentage of sales. The ever-increasing challenge is the growing number of channels to be used, and the constantly changing relative importance of them. But the best channel by all means has always been the product itself. Customers who buy it has it and use it often for a long time. People around them might see them using it. Satisfied users as well as dissatisfied users are happy to tell others about their experience. All of this is well-known facts. But what is less known is that it has become realistically possible to establish a continuous dialogue with the products and also the users of them depending of what product it is, by using modern M2M or Internet of Things technology. Examples of products that often are connected already are: trucks, electrical meters, cars, alarms, vending machines and coffee machines. They are typically connected for operational benefits like being able to tell the truck driver to go to a service facility and depending on where he is propose which one, for electricity companies to measure and report consumption almost in real-time, for vending machines to understand when it’s time to go there to fill it up and better schedule the service route, for coffee machine rental companies to change recipes over the air and for alarm companies to get the alarms automatically. This is all fine and the normal first phase of an M2M investment. Operational value is easy to realize and make ROI investments on thus easier to get project approval and budgets for. As we all know by now: data is the gold of M2M. And with these things connected we can gather and interpret the data from the connected things and start use it to create strategic value. Examples could be that the owner of the truck could measure how drivers actually drive, provide training to them and become a more sustainable company, the electricity company could offer customers better price off-peak hours, vending machines would get decision support from real data to know what products to have on weekends and warm days in different parts of the country and to use dynamic pricing, coffee machine companies could tune the choice of coffee for different seasons and learn customer’s coffee drinking habits and the alarm companies could add new adjacent services to their alarm infrastructure to become more competitive. All these things are examples of how the collected data could be used to add brand value, competitiveness, customer loyalty, innovation and attractiveness for employees, etc. We are in the teen-age of M2M aka Internet of Things and many companies have started to connect their things, mainly for operational reasons. But it is still very rare to see companies using the data to create strategic value. Most consumer goods is not connected and if it is, there is no organized use of the data collected. Most professional equipment isn’t connected either and if it is, the data is rarely used in an organized fashion to create strategic value. But this is about to change and I think we will see a lot of new examples in 2014. A number of new relevant ways of connecting things are available including the power-efficient and very small Bluetooth 4.0 chips with innovative solutions like iBeacon, networks optimized for connecting millions of autonomous things like Sigfox and a host of different ways to associate real life things with an avatar on the Internet like QR-codes, smart cameras, RFID and innovative solutions from companies like Evrythng. This isn’t about technology. It is only when clever strategists, progressive marketing directors, creative advertising agencies, determined product managers and innovative business developers really understand what is practically and financially possible today that true innovation beyond operational value creation starts to happen. 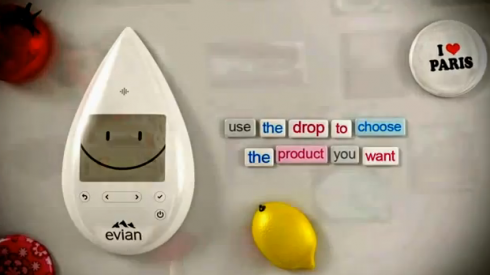 Interesting examples of creative customer communication through products could be the Evian Smart Drop, Volvo’s On Call app enabling their B2B+B2C model and Apple’s recent launch of an iBeacon based service in all 254 Apple Stores in the US. You are currently browsing the archives for the Markeing category.